The Center for Media Justice | Team Media Justice Shows Up for Net Neutrality in D.C. Team Media Justice Shows Up for Net Neutrality in D.C. Continuing the fight for a free and open internet for people of color and poor people nationwide, community leaders from the Media Action Grassroots Network (MAG-Net) arrived on Capitol Hill yesterday to urge Congress to save net neutrality. Participation in the national “Day of Advocacy,” organized by Public Knowledge, Center for Media Justice and other allied organizations, continues our network’s legacy of advocating for an open internet to ensure that the voices of vulnerable communities can be heard loud and clear in Washington D.C. Throughout the day, MAG-Net members, including BYP 100, Alternate Roots, Martinez Street Women’s Center, Philly CAM, and Media Mobilizing Project, met with several Congressional Tri-Caucus offices to urge them to pass the Congressional Review Act, which would overturn the FCC’s recent decision to end net neutrality rules. 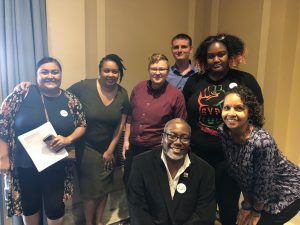 “For us, it’s about [people of color] not being able to reach their communities,” said Erin Shields, CMJ’s National Field Organizer, when speaking in the office of U.S. Rep. Jim Cooper about the urgency of the battle for an open internet. See some additional photos from the day on Facebook.